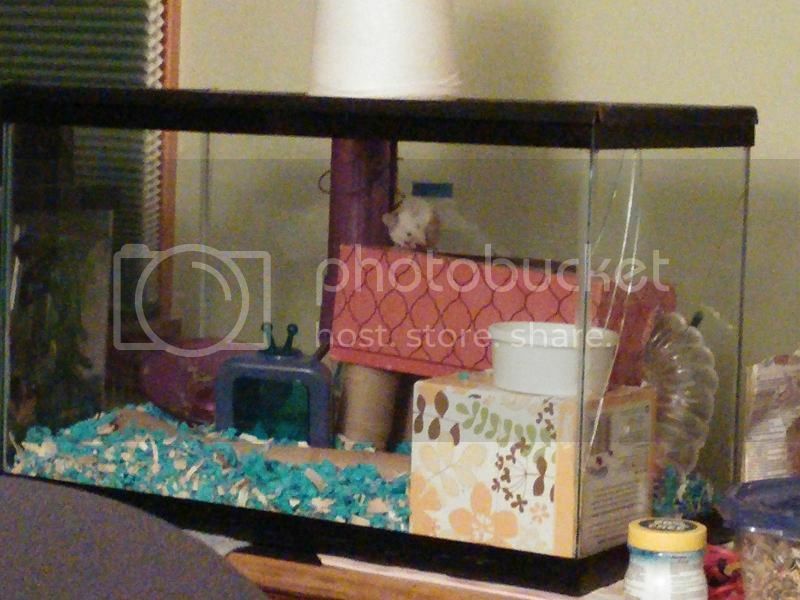 So I'm mouse-sitting for the holidays and since this is my first time with mice (I've had hamsters and a gerbil before) I thought i'd get some opinions! All they had in the crittertrail was a toilet paper tube and a flying saucer wheel, so I made them a maze of tubes, a tissue box house, and a second level made from a bigger tissue box and some toilet tubes for legs. I'm working on taming them and trying to give them a variety of toys and entertainment to make up for the lack of cage space. S'more has taken well to it and she will sit on my hand and eat if i'm still, but Nug wants nothing to do with the big scary hand and hides until long after it leaves. I'm going to try to attach a picture of S'more sitting on the second level...Sorry for the horrible quality, it was taken with my phone in low light and I had to zoom in so I wouldn't scare her down. It may be a territorial thing, in female mice I wouldn't be too concerned but if they were males it could spell the start of some serious fighting.